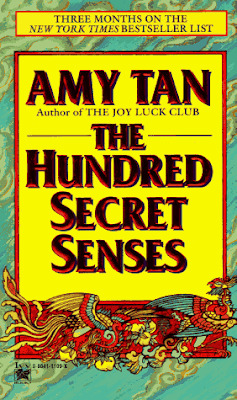 The Hundred Secret Senses by Amy Tan. Where do I even begin? I got the book months ago. When I finally picked it up from the pile, it took me weeks to finish. The beginning of the story didn't really capture my fancy, but once I committed to reading it through to the end, I was actually captivated by the stories weaved by Libby-ah and her sister Kwan. While reading, I had this vision of China that was much like Bangaan, the province where my grandfather came from. Mountains, rice paddies, cool, misty and peaceful. That was the Changmian I saw in my mind. But it wasn't the same one I saw when Kwan was recounting stories of Miss Banner and the rest of them. In my mind I was seeing the China from the older Jet Li movies. Kwan's disappearance puzzled me. I couldn't understand why she had to be gone. I guess it can't be perfect right? Did she know she was not coming back? It seems like so. The World of Yin. I've talked about this before - how, nearing my grandmother's death, she sees visitors. Plenty of them who have come to see her. She often mentioned women, friends, who have passed away years ago, coming to ask her to go with them. For a long time, she chose to stay. But then we'd see her startled sometime, as if she was still seeing them there. So do I think there's a World of Yin? I'm not sure really. But it's a comfort to know that when you go, you wouldn't have to be alone and afraid.